It’s a good lesson in crossing your T’s and dotting your I’s…..
Buzz started flying earlier this week on Facebook when a friend of mine posted on Facebook: “I just got a congratulations from Shutterfly on my new arrival. Either they are 22 months late or delusional.” I thought nothing of it until a few hours later, when I received the same email (my youngest is 11). I realized something was going on, and decided to investigate. 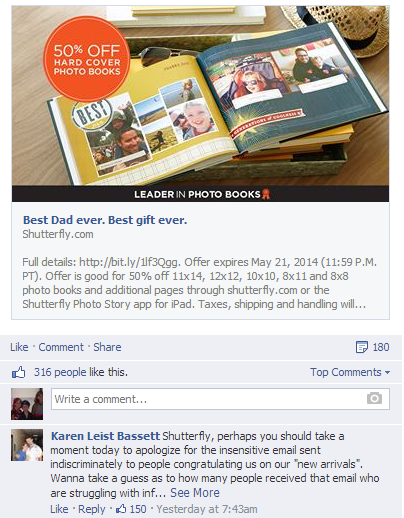 Shutterfly did comment on this thread, especially apologizing to those who were offended and hurt by that email. Mistakes do happen, but unfortunately it was surrounding a sensitive issue for many women. 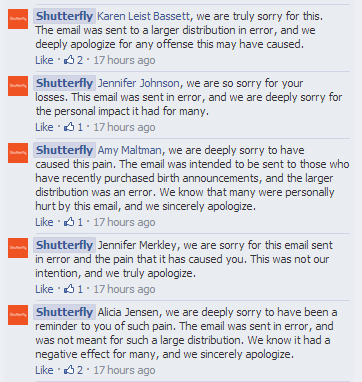 It seems that Shutterfly addressed the issue early, though they could have included their Facebook and possibly a statement on their website. Just a reminder to always double check when sending emails, ensuring customer lists are segmented and clearly identified in your system, and quickly and publicly addressing any issues when things don’t go well.